Are you afraid that you can’t actually accomplish your goals? Are you paralyzed by thoughts that you’re just not good enough? Fear causes us to believe that we can’t actually achieve our goals. And for some us, it’s the main reason we don’t allow ourselves to even think about, dream about, or even believe for a single moment that we can change our lives. And what do you do when you’re afraid? When fear is THE THING standing between you and your dreams? Between you and what you want the most? Popular wisdom might tell you to just do it anyways, to be brave and jump right in. You’ve no doubt heard that you need to be brave, take big risks or there’s no big payoff for you. No risk, no rewards! Anyone else feeling a little queasy just thinking about it? 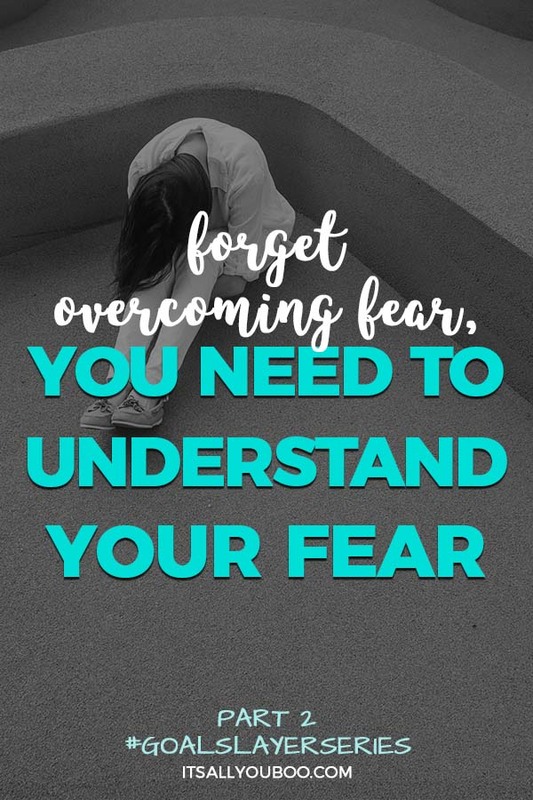 This type of “overcome your fears right now” advice can lead many of us to experience even deeper forms of fears and anxiety. “BIG RISK!” Yikes, way to clear a room. We’re led to believe that in order to even get started on our goals and dreams we need to first be brave, fearless and insanely confident in ourselves. That an “I can so do this, nothing can stop me, I am invincible” attitude gets us there. That in order to achieve your goals, you need to first overcome your fears, which is why we say, “I can’t, I’m afraid of (insert your fear of choice here)” and *hit the escape button* on our dreams. What if I told you that achieving your goals and living your dreams DOES NOT require you to overcome your fears? That you can be afraid and achieve your goals at the same time, that fear isn’t simply this major obstacle you need to overcome, but an important guidance system that you need to understand. This is Part 2, of a 6-Part Series on How to Actually Achieve Your Goals. #GoalSlayerSeries breaks down the honest unfiltered truth about what it really takes to achieve your goals. Each post explores one major mindset shift that you need to make in order to become a goal slayer (aka someone who achieves their goals without apology or excuse). In Part 1, we learned why we need to stop setting goals and start setting intentions instead. How intentions are the desire of our inner voice and how we can start listening. 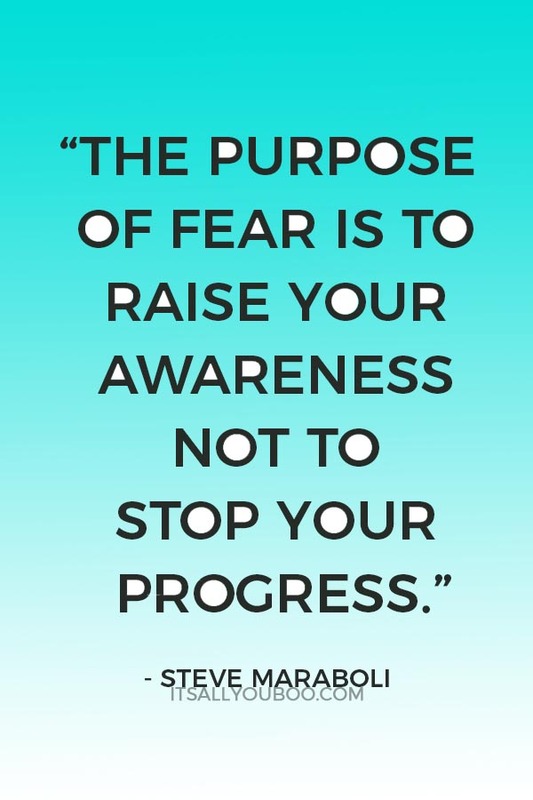 Let’s continue with how understanding your fear helps you take action. We’ve all felt it, we avoid it, but do we even know what fear really is? That’s a pretty intense definition. In other words, fear is your built-in warning system, it helps you stay safe when it senses imminent harm to your person. Your onboard alarm system (aka fear) goes off so you can act or react in a way that keeps you safe. Fear keeps you safe. It’s a good thing! Imagine living your life without ever feeling fear. Sure it sounds like a good thing, you’d be fearless, but you’d probably also be reckless, and quickly wreck your life. We encounter problems with fear when it activates to “keep us safe” from imagined threats. And oh how our mind LOVES to imagine threats, danger, doom, gloom, and destruction around every corner. I am convinced that all our imaginative powers from childhood grow up to work in the creating fear factory in our brains. Most of the fears we have now, real or imagined, we’ve picked up as we grow. They compound our instinctive, survival-based fears that trace back to early humans, who literally needed them to stay safe from very real dangers of wild animals and harsh conditions. Sabertooth tiger, ah! On the other hand, our learned fears are from experience or belief. We’ve interpreted these lessons as negative things that are bad for our safety, which is why we’re afraid. Whether that’s being afraid of catching a virus from exposure or being afraid of failing when we try. Have you ever tried something and have it go terribly wrong or not so great? A bad experience can be anything from feeling self-conscious and uncomfortable when you try something new all the way to having a traumatic life experience. What are you uncomfortable about? What events from your past haunt you? Does your mind play painful memories on repeat? All of this can cause us to “hit the escape button” at the thought of leaving our comfort zone, trying something new or putting ourselves out there. Your fear is “protecting you” from feeling like this again. We inherit belief systems from our parents, friends, religion, culture, and society. No matter where you live there’s a system of beliefs in place. You live your life according to these beliefs that inform what’s possible or impossible, what you should or shouldn’t do, what’s right and what’s wrong and so on. What do you believe is possible or impossible for you? What should you or shouldn’t you be doing with your life? Do you disagree with any “common wisdom”? Think of the belief system like the Matrix, it’s your programming! We’ve been taught how to think and how we should react. That certain outcomes are bad, and that we should “stay safe” by avoiding them. A popular common wisdom (or belief) is that going to university and getting a good job lead to a happy and successful life. Your parents believe it, your education system is built on it, you likely lived your life according to it. Perhaps like me, you’ve learned that this isn’t necessarily true. Whether or not leaving your 9-5, starting your own business/blog, or dare I say skipping University all together are actually “unsafe” choices, we still fear them. Real or imagined, it’s how our minds work and have been wired by experience and belief, to keep us safe. And for some of us, this fear keeps us “safe and sound” in a life we hate, working a job that drives us nuts, all for a pay cheque that keeps us safe. We’re miserable, we’re unfulfilled, ignoring our inner voice, but we’re physically okay. Realizations like this go against your base programming, so defying and redefining what “safe” actually is for you takes time. You can’t overcome this fear with the flip of a switch, that’s just not how it works. Perhaps it is that survival instinct still at work in us after all? You have dreams and goals you want to achieve, but you’re stuck at “I’m afraid.” Like the opening montage to an amazing movie, it starts playing and before the movie picks up, you hit the escape button. So instead of thinking about the all the good possibilities that could happen, we freeze, “hit escape” and stay where it’s safe in our comfort zone. You may not be able to control what happens to you or change “the system”, BUT you can control your thoughts. In this space, you are in control. You rule your mind! And here’s the trippy part, your thoughts create your reality. So by changing your thoughts, you are literally changing your reality. How amazing is that? Start disagreeing and disrupting your fears when they enter your mind. You want to achieve your goal, of course, you do! Who doesn’t? You decided to “stay safe” right where you are instead. And the next time, maybe your inner voice whispers that you’re unhappy and need to change. Fear keeps us safe until safe is no longer safe. Ask yourself, do you want to stay safe? Or do you want to be happy and actually feel successful about your life? Ask yourself, why do you believe you can’t actually do it? What’s the evidence? Or is this a limiting belief? Refute the fear by remembering a time you did something successfully. 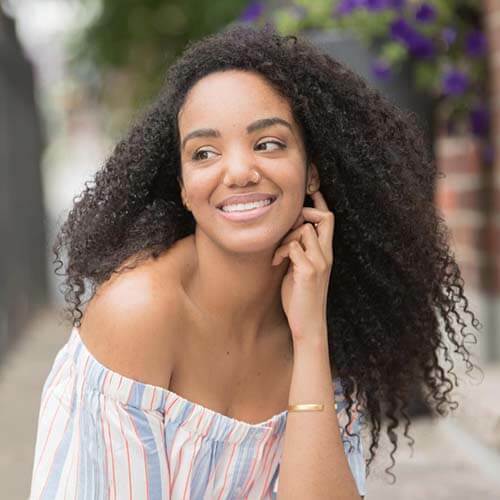 Bring it home, by saying “I choose happiness” (or whatever your own positive intention is – if you don’t have one check out part one of this series). It sounds too simple to work right? The more you do it the less real that fear becomes, and the less safe it starts feeling. You need to redefine for yourself what safe is, what you deserve and can actually live with. Safe is a place where you’re able to be yourself, feel like yourself and where you are comfortable enough to try and achieve what you want in this life. Anywhere else is unsafe, despite what your fears tell you. There’s a reason you want to achieve your goals and change your life. Safe isn’t so safe anymore, and you know it. It’s time to use fear to your advantage. Fear is not meant to paralyze us in inaction or indecision, but rather to guide us to make an informed decision or take an informed action. It’s meant for us to be aware and awake, not to run away but to find where is safe. The next time you’re afraid of achieving your goals go on the defensive with yourself. Why do you feel this way? Is it true or is it your programming? Is it your mind trying to keep you safe? What’s the worst thing that could possibly happen? And is that “worse” that staying where it’s “safe”? And then take one tiny step towards redefining what safe is. Do something that gets you a closer look at your goals and dreams. Understanding how you’ve developed your fears is the key to taking action despite them. I would never tell you not be afraid or to run head-on into what scares you. But rather to feel your fear, understand why you feel it, disagree with it and then take one tiny step towards it. You don’t need to be a fearless gladiator defeating your fears, you need to be an explorer, who seeks to understand and get closer to what you fear. Just one tiny step, one act of defiance. And the magical part of all of this is that every time you take a tiny step, a closer look at what you’re afraid of, you’re learning that there’s nothing to be afraid of. You’re teaching yourself that you’re okay! That you’re safe! No big risks required – no letters of resignation or big grand gestures. Just you getting a bit closer to what you want most in the world – to feel truly safe, happy and successful. To manifest your authentic self in your life. 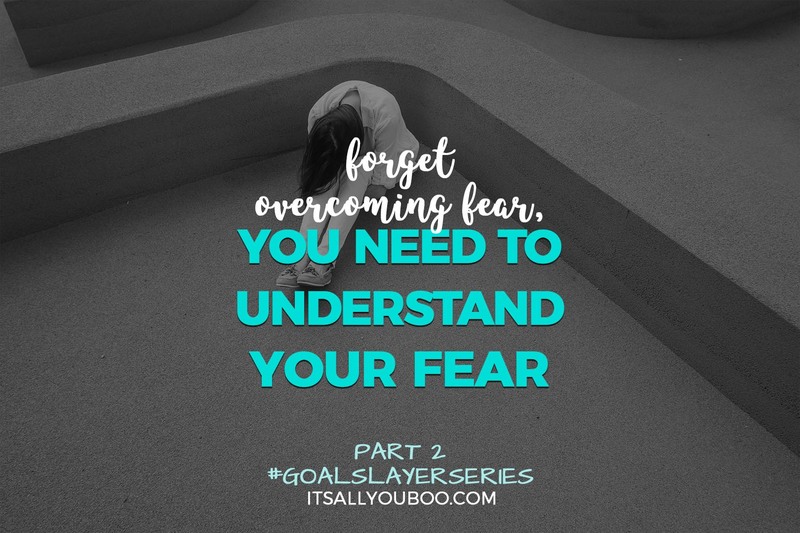 Go back to Part 1 of the #GoalSlayerSeries and seek your intention, make it your mantra, your new safe. You don’t need to overcome your fear to take action towards your goal, or to be fearless, just to take tiny steps that make you feel your fear less. Tired of being held captive by your fears? 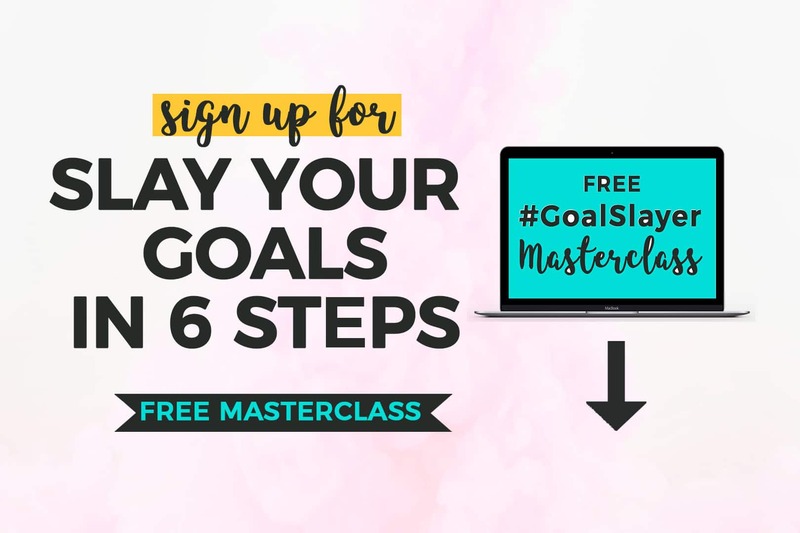 Sign up below for the FREE #GoalSlayer Masterclass to learn how to take action despite them. Sign up below to get instant access to the Masterclass + weekly tips to help you slay your goals. Are you ready to understand your fears? Leaning into your fear to understand it is a great point! Breakdown exactly what your fear(s) are can help you challenge it. For the ones that are legit, you can put backup plans or contingencies in place that helps mitigate the issue (fear). Things go wrong in life. The point isn’t to avoid it all. Avoid the situations that are truly catastrophic, or do something that reduces the risk, or backup plants (mitigation) should it occur. No amount of logic will over rule fear. But perspective change and backup plans can reduce it. Or give us confidence to move ahead with it. That’s quite right, there are times when things go off the rails. And mitigating disasters is always a good idea. Personally, I’m not sure I’ve ever really overcome any of my BIG fears, I’ve just learned to live with and move on with them. And not stare at or think about them every minute. Thank you so much for this! I have had goals for a long time that I was too scared to start. I just started on my website, so what you said really encourages me to keep going! YES, congrats on starting your website. Honestly, the first step is the hardest, just keep stepping closer and closer! This was a great post, you are right when you say not to be reckless when making these decisions. Sometimes I find fear is what drives us. Thanks so much for the blog love, glad you enjoyed. It does drive us, but we should use it to direct us, not recklessly, but with wisdom. The Steve M is one of my all time favorites. I’ve learned to see fear for what it is and to not let it stop me. I have to agree with you on that one – Steve M is epic. I love that, once you see it clearly you can act. Thanks, Evelyn! I chuckled to myself when I wrote that – but great endings aside, it really is true. It’s all about feeling the fear less, so we can move and take action. I understand and acknowledge my own fears. I channel it to a positive response so that I can be more productive. That’s a fantastic way to use your fear – it’s a great driver if we use it. Thanks for sharing! Goal setting is SO important! But I find the need to make multiple, small goals that are easily attainable; once you start crossing things off that list, it’s very motivating!! Who doesn’t love that boost of motivation from checking something off the list! It’s almost the same with fear, you get a bit closer, you want to take that next step to see how close you can get. I really enjoyed reading this post. Fear can really paralyze you from moving forward in life and making choices. Taking action is the only solution. Thank so much, I’m glad it was enjoyable! Yes yes taking that first step is really the only answer to the fear. But for some, we have to start with just taking a closer look, before we’re comfortable stepping towards it. I think the belief system is so important. If we believe it, it does seem we have the ability to make it come true. Belief systems inform our mindset, our behaviours, what we think is possible and what we fear. True or false, if we believe it, we’ll act a certain way – or not act if we’re afraid. So glad you found it insightful! 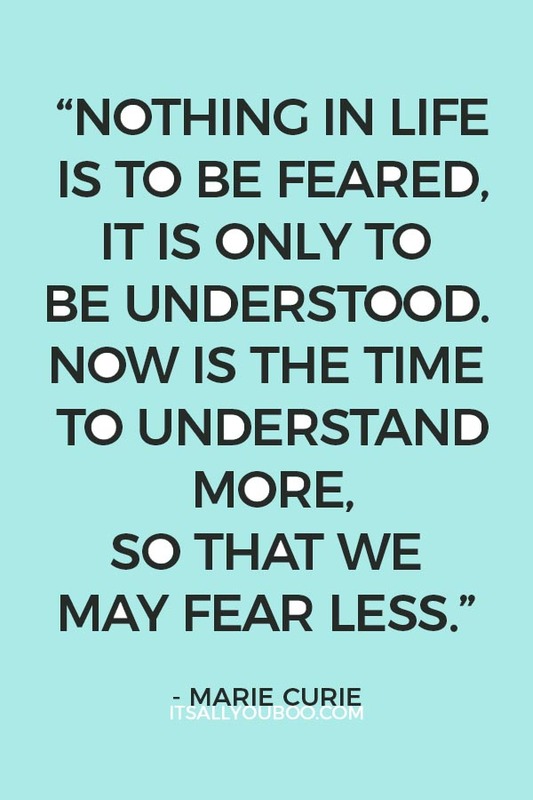 Yup – I so agree, understanding allows us to conquer them (if we can). Not sure we need to conquer or destroy them, we learn to live with and act in spite of them. Or at least that’s been my experience. 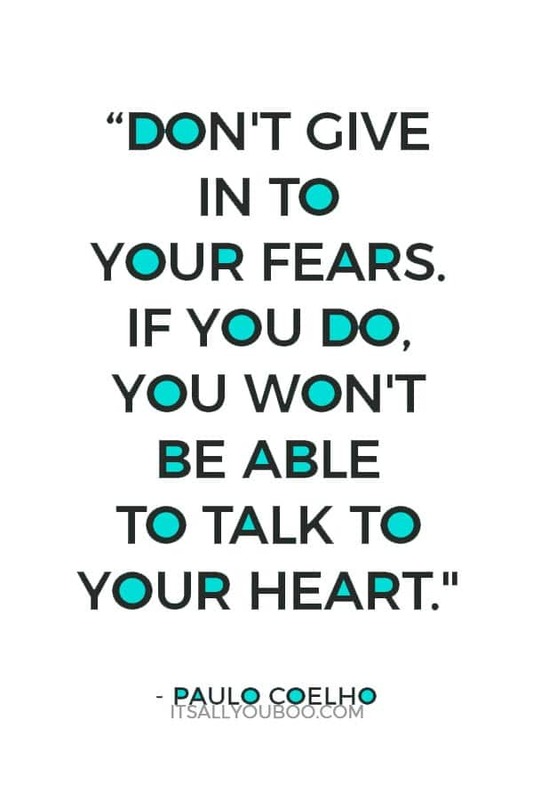 Love that you mention that – fear is a great motivator if you tap into it. Fear can be so very debilitating and unfortunately can creep up into our psyche without much awareness. It’s so crazy how fear works and how it continues to be something that we battle every single day of our lives. You’ve given some very good, and real tips in this blog post that can be applied in a variety of ways. Thanks for sharing!! Hmmm… yes, fear does creep up on us and it’s not until it’s got us frozen that we realize it’s there. Fear runs wild when we let it – we have to every day make choices, take actions that disprove it. I’ve found that’s the only way to really silence it and not let it hold us hostage. You’re so welcome, glad you found it helpful! That’s about what I do in some areas, although some fears are very hard to get past. I’m getting there for the difficult stuff. Yeah… it’s called fear for a reason. Some are mightier to take on than others, especially if they’re tied to horrible experiences. All we can do is try our best to push past them, one step at a time. Fear does slow me down. It makes me stop and pause. It doesn’t alway make me change my mind though; it may just make me drag my feet and possibly miss opportunities. Me too! It almost makes me hit the breaks, “wooohh.” It’s good that you have resolved to keep going in spite of them. I think having missed opportunities it makes you more likely to NOT miss them in the future. I usually feel the fear and do it anyway. Great points here. Many are too afraid to live a life. That’s great that you still act even when you feel it. That’s a perfect habit for dealing with your fears. One can’t live in fear – you’d just be frozen, not moving forward. I’ve been thinking about this lately, sometimes your so fearful and it messes with your thoughts and you are not even aware. That’s why posts like yours are so important. Definitely eye-opening! Cheers to eye-opening blog posts! Fear can play tricks on us, and knock us off our game. Gotta get stepping anyways, when you realize “oh I’m doing it and I’m okay” – the fear isn’t so loud anymore. Fear can be an awful thing when it comes to striving for what you want out of life. 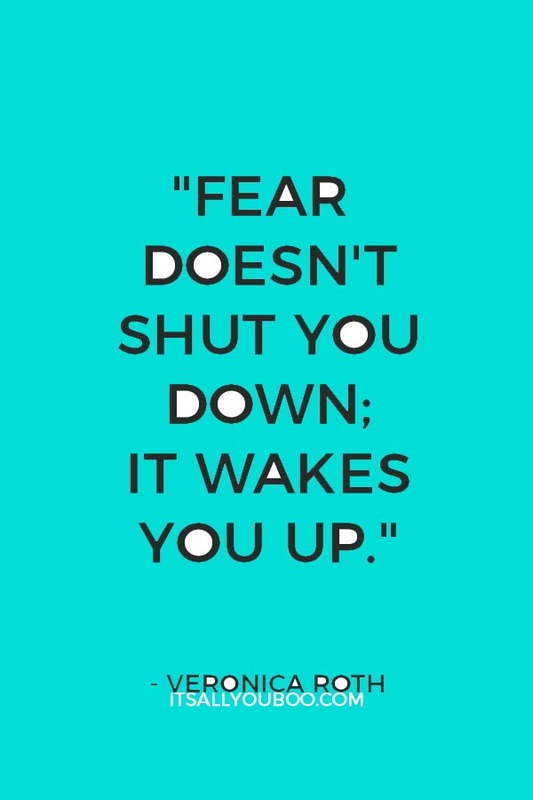 Making sure that you push through that fear is what is important! I completely agree with you – we need to push through, but first understand why it’s there, and use that to get us going. I’m currently learning how to work through fear. It’s annoying when you obviously have something that you want to do and it just moves your blood but then fear hits and you start to convince yourself that it’s hopeless. We need to stop being our own personal enemy at times. Stop listening to the world and start listening to our inner higher voice. Keep your thoughts and dreams to yourself and don’t share them with anyone because I’ve learned people can still tell you their fears and then it makes you not even want to work harder anymore. We can’t say we want to grow and allow ourselves to stay in our comfort zone. Get uncomfortable and make yourself known. Kill it better than anyone else. I ask myself at times “What would happen if I just did what I wanted? What if I just put myself out there? Be vulnerable.” Because I’m not learning anything just staying in this closet. I always have to ask myself what would the consequences be if I didn’t do the things that scared me? I strong believer that if it’s on your mind quite frequently and its something that makes you happy you need to do it. That’s your release from fear. Great post!